Poland, 200th anniversary exhibition for Jozef Poniatowski in Krakow. The exhibition consists of memorabilia related in various ways to the Prince, from the collection of the National Museum in Krakow. Józef Antoni Poniatowski was born on 7 May 1763 in Vienna to Andrzej Poniatowski and Teresa Kinsky. 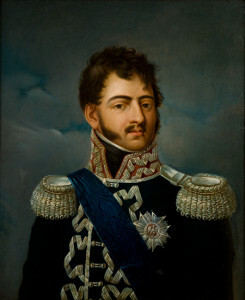 Bound for a military career, he eventually received the rank of General and became the Marshal of France; he was later announced as the Minister of War and Head of the Army of Warsaw County. On 19 October 1813, while covering the retreat of Napoleon’s forces during the Battle of Leipzig, Prince Józef was killed. His body, pulled out of water after five days, was brought back to Warsaw and buried in the Church of the Holy Cross a year later. His final interment took place on 23 July 1817 in St. Leonard’s Crypt at Wawel Cathedral. The Prince was a singular character, famous for his military talents and outstanding courage, but also for his adventurous, even extravagant lifestyle, which contributed to his legend when illustrated in numerous works of high and popular art. As a young man, he was a favourite with the Warsaw ladies, who gave him the nickname of Pepi. With Poland being progressively partitioned during his uncle’s reign, the young Poniatowski ultimately fought in the anti-Tsarist Kosciuszko Insurrection of 1794. After Poland had been wiped from the map, he joined forces with Napoleon, who in 1807 created the so-called Duchy of Warsaw, supposedly the kernel of a resurgent Poland. However, the 1812 campaign, which Bonaparte dubbed his “second Polish war,” ended in disaster, and Poniatowski fell the following year at the Battle of Leipzig. Legend recounts that the prince spurred his horse into the currents of the River Elster after refusing to surrender, a scene that duly became a staple subject for 19th century Polish painters. The most common depiction of Prince Józef presents him in a military uniform decorated with medals and a sash across his chest. On the portrait donated to the National Museum’s collection by Adam Wolański in 1906, he is wearing the “great” uniform of the Division Commander, the sash of the Order of the White Eagle, and the star of the Legion of Honour, which he received in 1809. In the same year, Poniatowski was awarded with the highest Polish military decoration – The Grand Cross of the Virtuti Militari Order. For over a century, he remained the only Pole decorated with such a prestigious medal. The star to the Grand Ribbon of the Virtuti Militari Order is the most precious element of our exhibition. After the Prince’s death, the star was allegedly brought to Poland by his valet. His heirs then sold it to Henryk Stecki, who presented it as a gift to Emeryk Hutten-Czapski in 1873. The decoration was eventually incorporated into the National Museum’s collection, together with other donations from Hutten-Czapski. In 2006, the unique relic experienced another turn in its history, when it was stolen from an exhibition in Warsaw. Thought to be lost forever, the missing order was eventually found in the Ukraine and re-joined the national collection in 2008. The exhibition runs at the central branch of the Historical Museum of the City of Krakow until 11 November.